CLAYTON MORRIS: Welcome back to Fox & Friends. We have some breaking news this morning. A suburban mom from Colorado, arrested in Ireland in connection with an Al Qaeda plot linked to "Jihad Jane." So with this developing news, and the recent arrest of a New Jersey man accused of ties to Al Qaeda, are we seeing a rise in homegrown terror? ALISYN CAMEROTA: Sure looks like it. 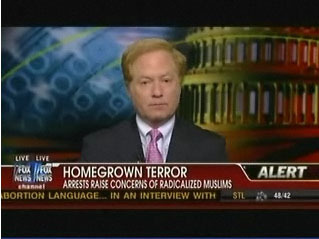 We're joined by Steve Emerson, terror expert and author of American Jihad: The Terrorists Living Among Us. CAMEROTA: This week, it's come to light, obviously, that these three Americans were arrested overseas for plotting terrorism of some kind. What do you make of that? EMERSON: I think we're seeing a definite rise in homegrown jihadism in the United States and I think it's largely based on the fact that the jihadist narrative is the narrative that is very appealing to them – it provides them with a sense of community, a sense of mission, a sense of identity, and, unfortunately, when one converts to Islam, as we have seen now with two of these cases, the Islam that they convert to is a radical Islam. So there isn't really an alternative version for them – a moderate version for them – to convert to. And I think that the radicalization in the United States is far more prevalent than I think authorities are willing to admit. MORRIS: What about from the other side of this argument, which some on the Right have suggested that we need to be profiling individuals in the United States now, looking for specific people? These people don't seem to fit the mold of the profile. A 31 year old mom of a child of 6 years old from Colorado, blonde hair – it doesn't seem to fit that mold. EMERSON: Well, profiling just based on physical characteristics wouldn't fit her, but if you carry – if you included the fact that she was advertising herself on jihad websites, which was not difficult to find – I mean anybody could've found that "Jihad Jane" was willing to become a martyr, recruiting others to carry out jihad, raising money for terrorist activities. If you included that in the mix of the profile, you would have found her. So I think that the profiling mix needs to include a whole variety of factors of intelligence that would lead someone to believe that their belief in jihad is an indicator that they're willing to carry it out. And remember this guy Sharif Mobley, who was a Somali-American who was caught in Yemen after killing a guard; he worked at nuclear power plants in Virginia and Delaware – and Pennsylvania – from 2002 to 2008. Four years ago, one of his friends who served in the Army in Iraq said that Mobley said "you're a baby killer – a killer of Muslims." And I think that would have been an indication that this guy had become radicalized. CAMEROTA: Steve, I just want to circle back to something that you had said earlier, and that is that if they convert to Islam here in the U.S., there is no moderate version that they can kind of bond with and find community. Why is that? Isn't there? I mean, they choose the radical side of that through these websites. Isn't there a more moderate Muslim voice that they could bond with? EMERSON: Alisyn, if I showed you the number of jihadi websites that are on YouTube, that are on the web – they are in the thousands, the tens of thousands. If I showed you the number of "moderate websites" that eschew jihad, that disavow violent extremism, they would be in the tens. So unfortunately, Saudi Arabia and other countries, plus the Wahhabist version in the United States, and the Muslim Brotherhood, control the websites that are basically disseminated throughout – and they also control many of the mosques in the United States that should dissuade people from becoming jihadists, but, in fact, actively encourage them. MORRIS: Well, the book is called American Jihad: The Terrorists Living Among Us. Steve Emerson, thanks so much for your insights this morning. We appreciate it.